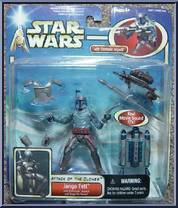 The most dangerous bounty hunter in the galaxy, Jango Fett is fully equipped to defend himself from any adversary. His sleek armored suit features retractable wrist blades and other concealed weaponry. His harnessed backpack, capable of jet propulsion and missile projection, provides powerful leverage over the most steadfast opponents! Contribute pictures, update details or suggest corrections for Jango Fett (Electronic Jetpack). 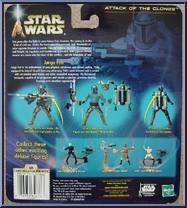 Write a review about Jango Fett (Electronic Jetpack).